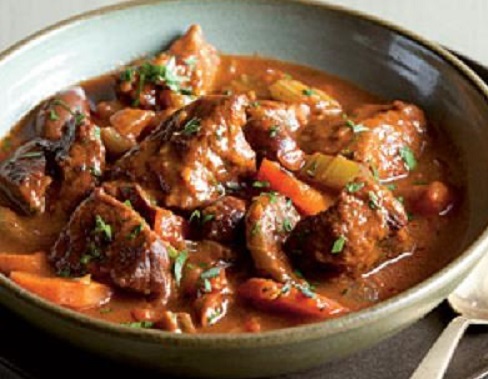 Traditional meat stews can add up to 1,000 calories per serving. The calories really depend on the protein used, as fatty cuts of meat contain more calories. The sodium level can also be off the charts, providing much more than the amount recommended per day. Watch portion sizes, also. Ground turkey isn’t always the leanest choice – it depends on which part of the turkey is ground. And, while ground turkey breast is the leanest, it can end up rather dry after cooking. The best solution is a combination of white and dark ground turkey meat which will keep the meat moist while saving on calories. A healthy version of traditional beef stew should use 4 ounces of beef per serving while adding lots of vegetables. To keep sodium under control use a low-sodium beef or vegetable broth. Seafood is also a good choice for stew. Lentils are also a good stew ingredient because they contains both healthy protein and carbs and they are filled with fiber to help keep you satisfied. 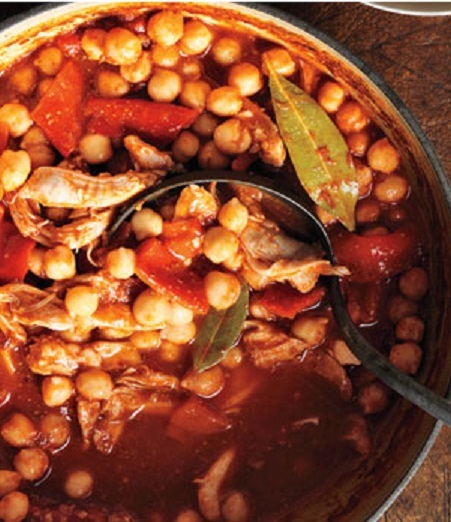 So, take control of the ingredients and make your own delicious, healthy stews. Since it is quite cold here in the south today, the Bean and Sausage Stew is on our menu. In a 5-quart Dutch Oven, melt butter. Add onions and cook, stirring occasionally until onions soften slightly, about 6 to 8 minutes. Add garlic and cook until fragrant, about 2 minutes. Add celery, fennel, chili, oregano, thyme, basil and cayenne; stir to combine. Add wine, tomatoes, broth and clam juice. Bring to a boil. Reduce heat to a simmer, cover and cook for 45 minutes. Meanwhile, soak clams in cold water for 20 minutes. Using a slotted spoon, transfer clams to the stew pot. Cover and cook until clams open, about 20 to 25 minutes. Discard any unopened clams. Add crab claws, cover and cook until heated through, about 10 minutes. Add cod and scallops. Cover and cook until the fish is firm, about 5 minutes longer. Sprinkle with parsley and serve. What makes this stew easy? Toss all the ingredients together in a Dutch oven, place it in the oven and forget about it for two hours or cook it all day in your slow cooker. Pat meat dry with paper towels. In a large plastic bag with a tight-fitting seal, combine flour, salt and pepper. Add meat and shake until well coated. Shake off excess flour. Heat 1 tablespoon oil in large heavy-bottomed Dutch oven over high heat until just starting to smoke. Add half of the beef and cook until well browned on all sides, about 8 minutes total, reducing heat if oil begins to smoke. Transfer beef to large plate. Repeat with remaining beef and oil. Leave the second batch of meat in the pot after browning and add the browned beef on the plate and the remaining ingredients to the Dutch Oven. Mix well. Cover, place in the oven and bake for 2 hours or until the meat is tender, stirring once or twice during the cooking time. Taste and adjust for salt. Serve hot. Heat the oil in a large stockpot over medium-high heat. Add the sausage and brown until cooked through, about 5 minutes. Using a slotted spoon, transfer to a plate lined with a paper towel. Place on a plate and refrigerate until the beans are cooked. Add the tomato paste and oregano to the same pot. Cook, stirring, until dark golden, about 2 minutes. Add the carrots, celery, onion and garlic. Cook, stirring, until the vegetables have softened, about 5 minutes. Stir in the beans, 8 cups water, salt, thyme, rosemary and the bay leaf. Turn the heat up to high and bring to a boil. Then reduce heat to low and simmer gently until the beans are tender, about 1 1/2 to 2 hours, adding more water if needed to make sure the beans remain submerged. When the beans are tender, return the sausage to the pot. Simmer for 5 minutes or until the sausage is hot. Stir in the vinegar and pepper. Taste and adjust seasoning. Ladle into warm bowls and serve drizzled with additional vinegar and olive oil. Heat oil in a large saucepan over medium-high heat. Add onion and saute 2 minutes. Add chicken thighs and hot sauce; saute until chicken is no longer pink, about 3 minutes. Add broth, lima beans, tomatoes, cauliflower and thyme; bring to a boil over high heat. Reduce heat; simmer uncovered 20 to 25 minutes or until chicken is cooked through and the beans are tender. Serving size: one chicken thigh and one-fourth of the stew. Return sautéed vegetables to the Dutch Oven. Add tomatoes and broth and bring to a boil. Reduce heat and simmer 10 minutes, or until the pork is tender. Season with salt and pepper, garnish with basil and oregano and serve. Summer is here along with just about every vegetable you could possibly want to cook. It is also the best time to make a delicious chowder. 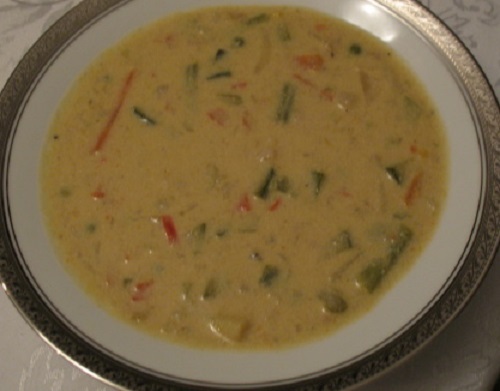 Chowder usually indicates a soup that is rich and creamy with chunks of seafood and vegetables. The term may also describe a hearty soup made with corn or chicken. The most famous, of course, is New England Clam Chowder. 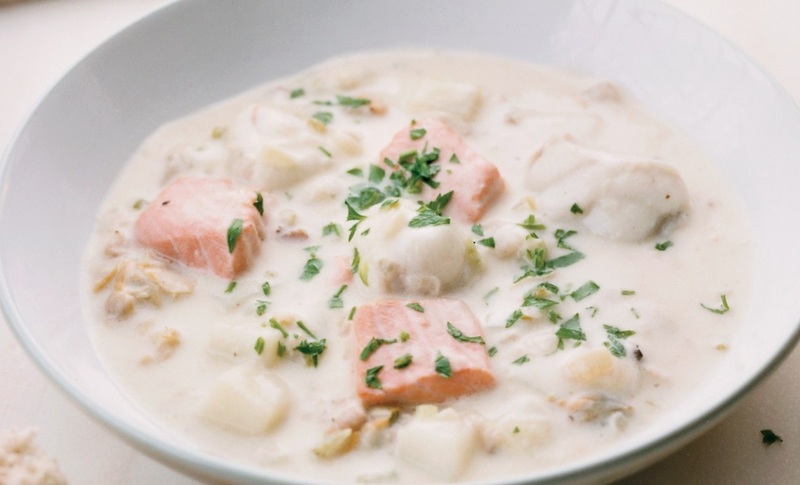 It is believed that the word “chowder” evolved from the French word “chaudiere,” the name of the pot in which French fisherman would boil their catch of the day with potatoes and other vegetables. French settlers in the New England colonies introduced the culinary tradition to America. 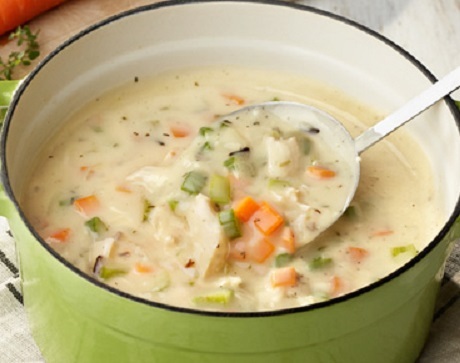 “Chowder” first appeared in a written recipe in 1751 and, by the 1800s, American cooks were using mostly clams instead of fish because of the abundance of shellfish in the northeast. Italian chowders and stews are usually made with seafood. 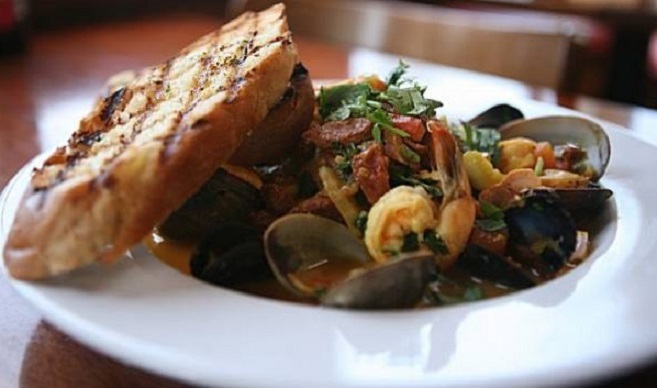 The true story of cioppino begins with ancient Mediterranean fishermen who created the first fish soups and stews. These recipes were adopted by seamen and the recipes used local ingredients. 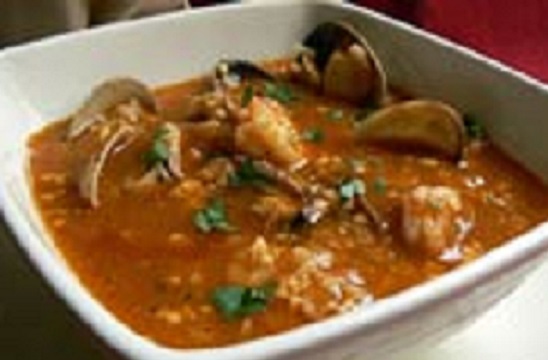 Cioppino belongs to the same tradition as a chowder and a bouillabaisse. 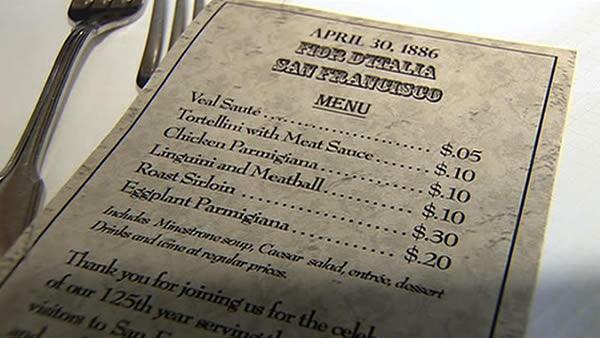 American cioppino is a story of immigration patterns, ethnic heritage and local adaptation. 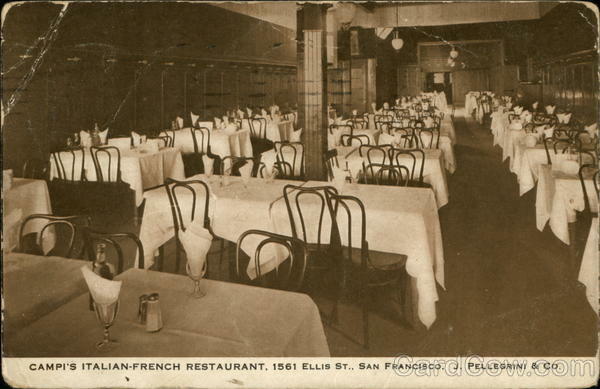 Food historians, generally agree, cioppino originated in California (in the San Francisco Bay area) and the group of Italian fisherman credited for the recipe immigrated from Northern Italy, specifically Genoa. 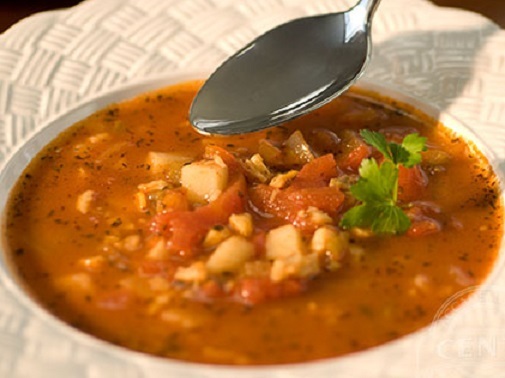 East Coast Italian Americans were fond of Manhattan Clam Chowder and put their special touches to it. Medium-sized hard-shell clams provide the flavor for the broth and the tender clam meat for this hearty soup. Instead, the broth is briny and clean tasting with flavors from the sea standing out. If you do not want to fuss with fresh clams substitute 4 cups of clam broth and 16 oz of canned clams. 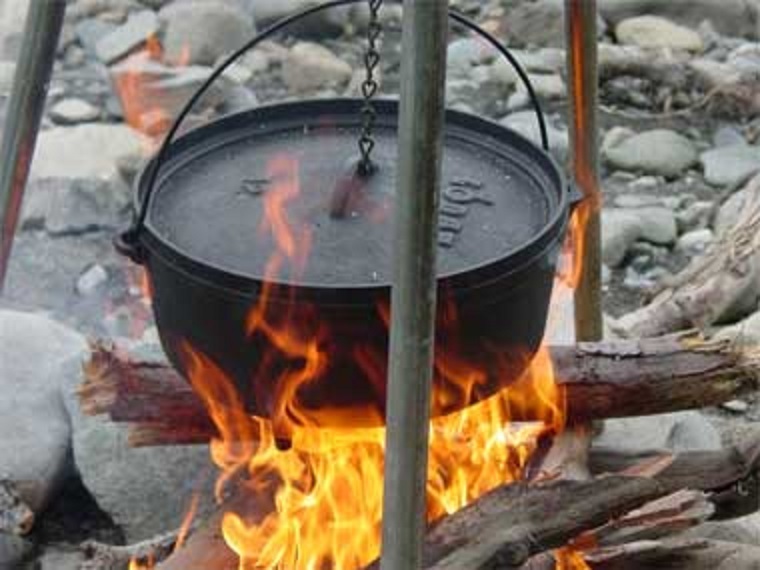 Bring 4 cups of water to a boil in large stockpot or Dutch oven. Add the clams and cover with a tight-fitting lid. Cook for 5 minutes, uncover, and stir with a wooden spoon. Quickly cover the pot and steam until the clams open, 4-5 minutes. Transfer the clams as they open to a large bowl; cool slightly. Reserve the cooking water. Holding the clams over a bowl to catch any juices, sever the muscle that attaches the clam to the shell and transfer the meat to a cutting board. Discard the shells. Cut the clams into 1/2-inch dice; set aside. Pour the broth that collected in the bowl into a 2-quart glass measuring cup, holding back the last few tablespoons of broth in case of sediment; set the clam broth aside. (you should have 5 cups; if not, add some of the cooking water to make this amount. Rinse and dry the pot, then return it to the burner. Fry the pancetta in the empty pot over medium-low heat until the fat renders and the pancetta is crisp, 5 to 7 minutes. Add the onion, pepper, carrot and celery, reduce the heat to low, cover, and cook until softened, about 10 minutes. Add the garlic, oregano, fennel seeds and pepper flakes and saute about 1 minute. Add the reserved clam broth, bottled clam juice, potatoes and bay leaf. Bring to a boil, reduce the heat to medium-low, and simmer until the potatoes are almost tender, 8 to 10 minutes. Add the tomatoes, bring back to a simmer, and cook for 5 minutes. Off heat, stir in the reserved clams and season with salt and pepper to taste; discard the bay leaf. (Chowder can be refrigerated in an airtight container for up to 2 days. Warm over low heat until hot.) Stir in parsley and ladle the chowder into individual bowls. Serve immediately. Cook the bacon in a large skillet until crisp and remove to a plate. Crumble when cool enough to handle. Add the onion and cook in the bacon drippings over medium heat until the onion is lightly browned and tender. Stir in flour until blended into the mixture. Add chicken broth and stir to blend. Add diced potatoes, corn and cream-style corn, pepper and hot sauce. Bring to a simmer and continue cooking for 5 minutes, stirring frequently. 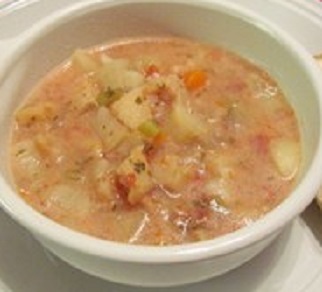 Cover, reduce heat to low and continue to simmer, stirring occasionally, until potatoes are tender. Add milk and cook, covered, for another 15 minutes. Sprinkle crumbled bacon on top. In a large soup pot on medium heat, sauté the onions in the butter and oil for 3 to 4 minutes. Stir in the celery, cover, and cook until just soft, stirring occasionally. Add the carrots, potatoes, water or stock, thyme, bay leaf, salt, and pepper and bring to a boil; then reduce the heat, cover, and simmer until the vegetables are just tender, about 5 minutes. With a strainer or slotted spoon, remove about 1 1/2 cups of the cooked vegetables and set aside in a blender or food processor. Add the green beans, bell peppers, and zucchini to the soup pot and cook until the green beans are tender, about 5 minutes. Stir in the parsley, simmer for 2 more minutes, and then remove from the heat. Puree the reserved vegetables with the milk and cheeses to make a smooth sauce. Stir the sauce into the soup and gently reheat. In a large stockpot, heat oil over medium heat. Add onion and saute until soft, about 6 minutes. Add garlic and saute for 2 minutes. Add potatoes and carrots, stir, then add fish stock and tomatoes, bay leaf, thyme, paprika, cayenne, salt and pepper. Add just enough water to cover potatoes. Simmer until the potatoes are tender, about 10 to 12 minutes. Add fish and stir. Cook until fish is opaque and cooked through, about 8 to 10 minutes. While fish cooks, heat milk in a small saucepan over medium heat until hot. Do not let it boil. Add milk to soup mixture and stir. Keep at low temperature. To serve, ladle into shallow bowls. Top with chopped parsley and a sprinkling of smoked paprika. Saute onion, celery and garlic in olive oil in a large soup pot. Add chicken and sauté until lightly brown. Add broth and Parmesan cheese rind. Simmer for 10 minutes. Add squash and simmer until the squash is tender. Remove the cheese rind. Place flour in a bowl. Gradually add milk, stirring with a whisk until blended; add to soup. Cook over medium heat 15 minutes or until thick, stirring frequently. Stir in cheese, basil, salt and pepper. The best winter recipes will warm you up inside and out, will warm your home and make your house smell fantastic. 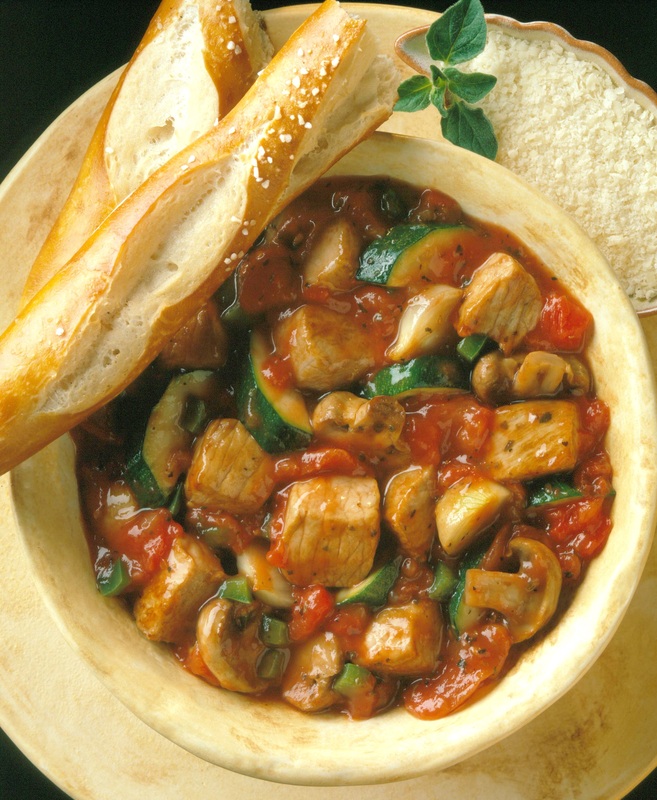 Soups, stews, casseroles and chili are very versatile dishes. Not really in the mood to cook after a long day at work? Let your crock pot do the work for you. There are lots of crock pot recipes out there for stews, roasts, chicken, chili and more. Even if your recipe doesn’t call for it, it’s easy to add or substitute any veggie or lean meat that you have in the refrigerator. These types of recipes usually make a lot of servings. You can always freeze leftovers in individual containers, so you’ll have a quick, pre-portioned meal for another day. 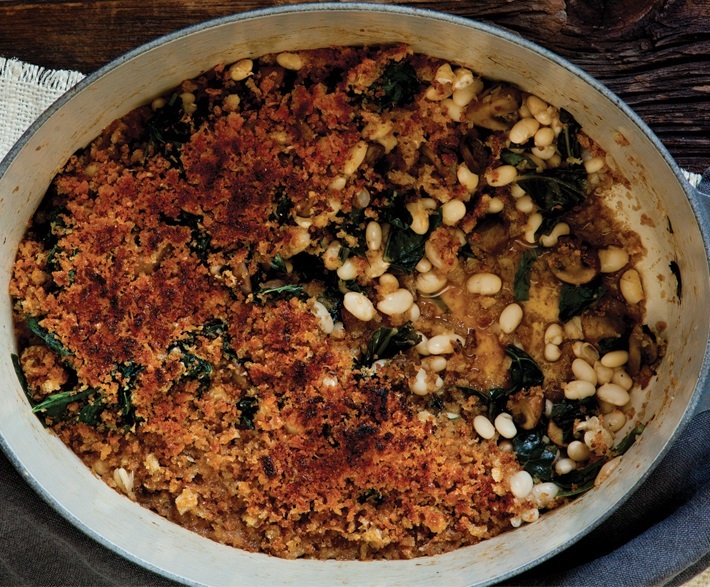 Below are five dinners guaranteed to help you warm up. 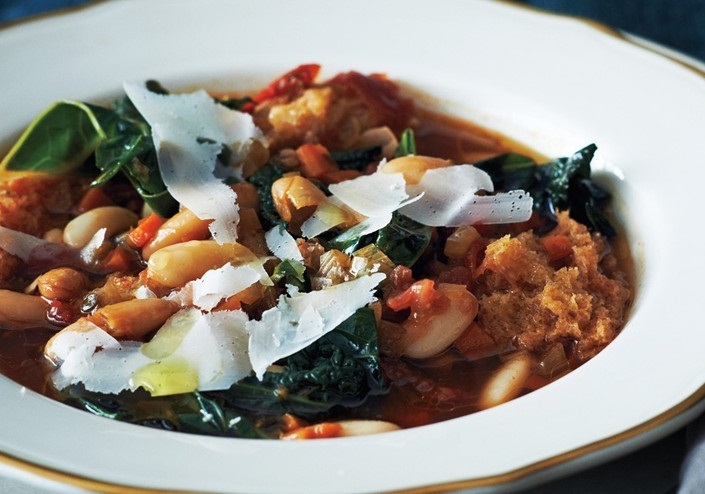 This dish is perfect for a cold winter night and is a complete meal all in one bowl. In a large pot of boiling salted water, cook the broccoli rabe for 2 minutes. Drain thoroughly. Cut into 2-inch lengths. In a large frying pan, heat 1 tablespoon of the oil over moderately high heat. Add the sausage links and cook, turning, until browned, about 10 minutes. Remove to a plate. When cool enough to handle, cut into slices. Pour off all but 1 tablespoon of the fat from the pan. Reduce the heat to moderately low. Add the onion and garlic and cook, stirring occasionally, until translucent, about 5 minutes. Add the wine; bring to a simmer. Add the sausage slices, tomatoes, broth, thyme and 1 1/4 teaspoons of the salt. Bring to a simmer. Cook, uncovered, for 15 minutes. Add the broccoli rabe, parsley and pepper to the sauce; bring to a simmer. Meanwhile, in a medium saucepan, bring the water and the remaining 1 1/4 teaspoons salt to a boil. Add the polenta in a slow stream, whisking. Whisk in the remaining 3 tablespoons oil. Reduce the heat and simmer, stirring frequently with a wooden spoon, until very thick, about 20 minutes. 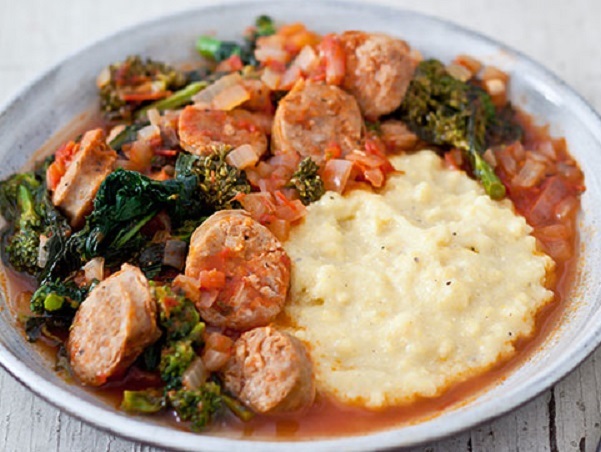 Serve in individual pasta bowls and pour the sausage/broccoli sauce over the top. Sprinkle with grated Parmesan cheese. In a saucepan, cover the potatoes with the water and bring to a boil. Cover the pan and cook over moderate heat until the potatoes are tender, about 6 minutes. Remove from the heat and let stand, covered. In a large saucepan, heat 1 tablespoon of the oil. Add half of the onion and garlic and cook over moderate heat until softened, 5 minutes. Add the wine and bring to a boil. Add the mussels, cover and cook over moderately high heat until they open, 3 minutes; transfer to a bowl. Add the clams to the saucepan, cover and cook. As the clams open, transfer them to the bowl. Strain and reserve the cooking liquid. Remove the mussels and clams from their shells and coarsely chop them. Add the remaining 1 tablespoon of olive oil and the bacon to the pan and cook over moderate heat until crisp, 4 minutes. Add the celery and the remaining onion and garlic. Cover and cook over moderately low heat until softened, 7 minutes. Stir in the flour, then gradually whisk in the potato cooking water. Bring to a boil, whisking, and cook until thickened slightly. Add the potatoes and the half and half and bring to a simmer. Add the salmon and fish and simmer over moderate heat, stirring a few times, until the fish is just cooked, 3 minutes. Add the mussels and clams and pour in their reserved cooking liquid, stopping before you reach the grit at the bottom; stir until heated through. Season with salt and pepper and add the parsley. Serve the chowder in bowls. A salad is all that is needed to complete this meal. Preheat the oven to 350 degrees F. Lightly coat a 2-quart rectangular baking dish with cooking spray; set aside. Cook gnocchi according to package directions. Drain. Transfer to a large bowl. Stir in marinara sauce; set aside. Meanwhile, in a large bowl combine ground beef, ¼ cup chopped onion, egg, bread crumbs, oregano, basil, garlic powder and fennel seeds. Shape meat mixture into 24 equal balls, about 1 inch round. In a large skillet heat 1 tablespoon olive oil over medium heat. Add mushrooms, bell pepper and the remaining onion; cook about 7 minutes or until tender. Add vegetables to the bowl with the gnocchi. In the same large skillet heat the remaining oil over medium heat. Cook meatballs, half at a time, about 6 minutes or until cooked through (160 degrees F), turning occasionally. 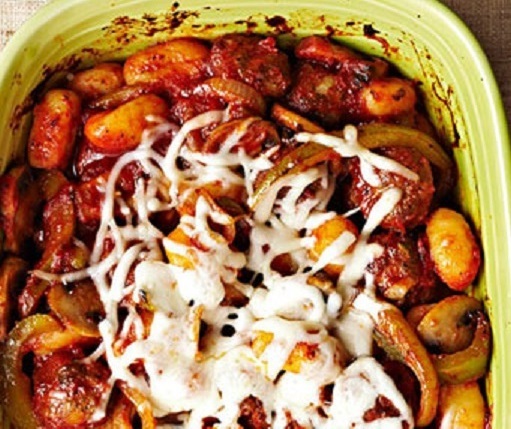 Transfer meatballs to the bowl with the gnocchi and vegetables. Gently stir to combine. Pour gnocchi mixture into prepared baking dish. Cover with foil. Bake for 20 minutes. Sprinkle cheese on top. Bake, uncovered, about 10 minutes more or until cheese is melted and golden brown. Combine bread crumbs, Parmesan and the 2 teaspoons of olive oil in small bowl. Set aside. Heat remaining 1 tablespoon of olive oil and butter in large ovenproof skillet or Dutch oven over medium heat. Add mushrooms; increase heat to medium-high. Stir, cover pan, and cook 5 to 6 minutes, or until mushrooms are lightly browned, stirring occasionally. Uncover the pan, add garlic and stir 30 seconds. Add kale, and cook 2 minutes, or until wilted. Add beans, broth and 3/4 cup water. Cover, and simmer 6 to 8 minutes, or until liquid has reduced by about three-quarters. Stir in the lemon juice and remove from the heat. Heat broiler to high. Sprinkle bread crumb mixture over stew and broil 3 minutes, or until topping is golden. Serve with a vegetable side dish for a complete meal. Preheat the oven to 425 degrees F. Spray the bottom of a baking dish with nonstick spray. Heat oil in a skillet over medium heat, add prosciutto and cook until crisp. Remove to a mixing bowl. Add spinach to the skillet and stir until slightly wilted, about 2 minutes. Remove from heat. Transfer wilted spinach to the bowl with the prosciutto. Add cream cheese, Parmesan and ¼ teaspoon of salt. Stir until thoroughly combined..
Divide spinach mixture evenly among the chicken breasts and spread over the surface. Roll up chicken, dip in egg and roll in breadcrumbs. Place chicken rolls seam side down in the prepared pan. Bake 25 to 30 minutes. Remove from oven. 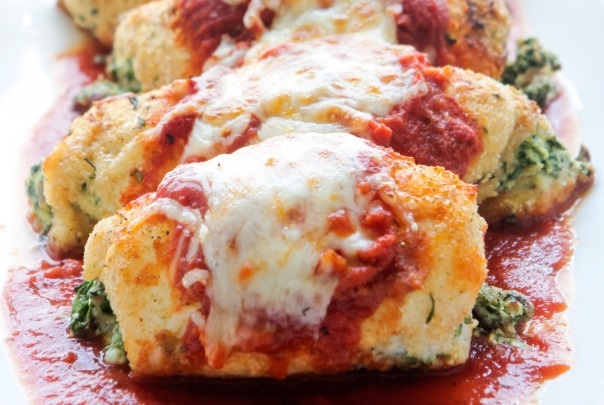 Spoon on marinara sauce and sprinkle with mozzarella. Turn on the broiler and broil the chicken rolls 2 to 3 minutes, until the cheese melts. Although they may be cheap, lentils are very nutritious, filling and very flavorful. From a nutritional standpoint, they are rich in fiber and in iron and are, consequently, ideal for people suffering from anemia. Lentils have been a source of sustenance for our ancestors since prehistoric times and lentil artifacts have been found on archeological digs dating back 8,000 years. As a plentiful source of protein, lentils were found on the tables of peasants and kings alike and the poor, who could not afford fish during the season of Lent, substituted lentils. Thought to have originated in the Near East and/or the Mediterranean area, lentils are small disks resembling a flat baby pea. When halved, dried lentils resemble their split pea cousins. They grow two to a pod and are dried after harvesting. 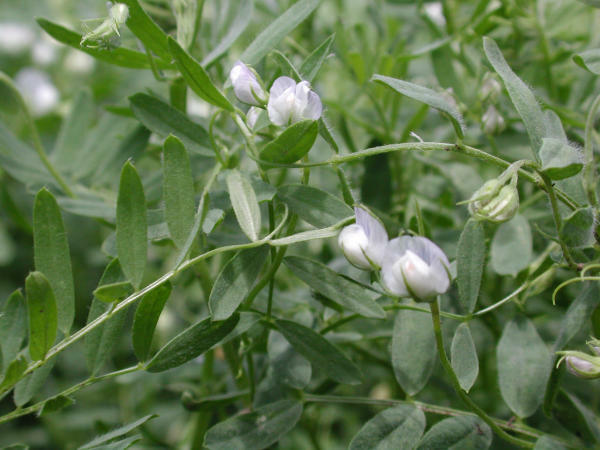 In Italy two major types of lentils are grown: the hiemal strain matures in late summer and produces larger seeds that are more delicate in flavor, whereas the minus strain matures in the spring and has smaller seeds. In addition to playing an important role in soups and other first course dishes, lentils are a traditional Italian accompaniment for sausages. Lentils are served on New Year’s Day in Italy because their shape brings to mind tiny coins and people eat them in the hope that they won’t want for cash during the rest of the year. There are hundreds of varieties of lentils, with as many as fifty or more cultivated for food. 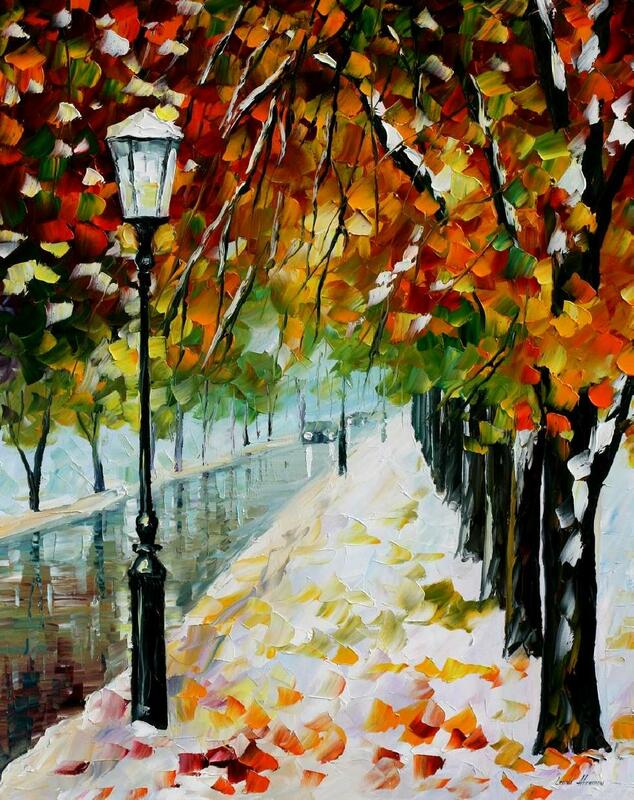 They come in a variety of colors with red, brown and green being the most popular. Lentils have an earthy, nutty flavor and some varieties have a slight peppery taste. Select lentils that are dry, firm, clean and not shriveled. 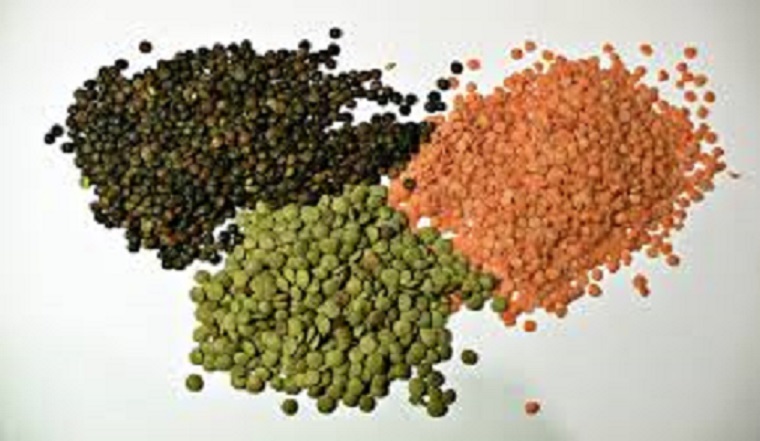 The color of lentils you choose will depend on your usage, but in general, the color should be fairly uniform. Canned lentils are also available, but it is just as easy to cook your own. If your recipe calls for a lentil that will retain its shape when done, common brown lentils are the usual choice. Brown lentils still have their seed coat and have not been split. Most red, yellow and orange lentils tend to disintegrate with long cooking because the hulls have been removed. Slightly sweet in flavor, these are best reserved for pureed soups or stew thickeners. Other choices include French lentils which are olive-green and slate-colored. These will cook up the firmest. Persian green lentils will turn brown as they cook and become tender while still retaining their shape. Considered the most flavorful (and most expensive) are the French Puy lentils, which also retain their shape. 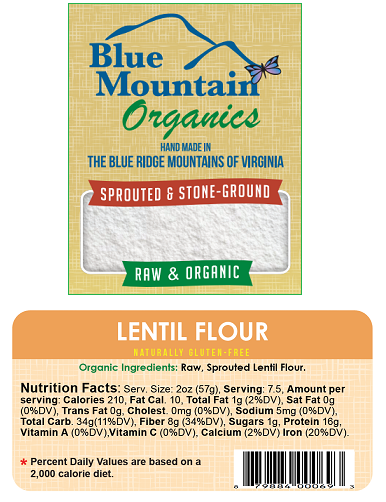 You may be able to find lentil flour in some specialty markets. It is used in India to make a fermented dough for bread. Dried lentils have an indefinite shelf-life, yet another reason why our ancestors kept them as a staple food. With age, the color may fade a bit, but the flavor will not deteriorate. Store lentils in a sealed package or airtight container in a cool, dry place. 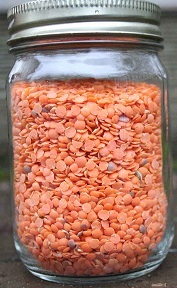 Cooked lentils may be refrigerated up to one week in a sealed container. Cooked lentils may also be frozen up to six months. However, they may fall apart when reheated, if not handled gently. These measures will help you determine how many lentils you need for your recipe. 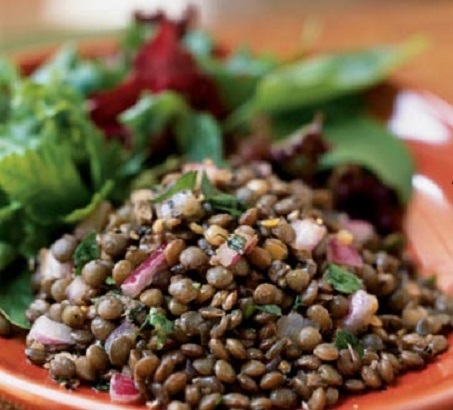 Lentils are a natural in soups and stews and also make a great cold salad. The high protein content in lentils makes them an excellent meat substitute. Lentils need no pre-soaking and cook much more quickly than other dried legumes. To cook lentils, simply pick over to remove debris or shriveled lentils, rinse and drain. Cover with water or broth and boil for 2 to 3 minutes. Reduce heat and simmer until tender. Depending on the variety and age, cooking time may take anywhere from 10 minutes to 1 hour. Add salt once the lentils are completely cooked. Acidic ingredients such as wine or tomatoes can lengthen cooking time. You may wish to add these ingredients after the lentils have become tender. Older lentils will take longer to cook because they have lost more moisture. Do not mix newly purchased lentils with old ones. They will cook unevenly. Lentils are popular across Italy, where they are grown in Umbria in the north and Puglia and Sicily in the south. Technically not a “bean,” lentils are legumes. Unlike beans, lentils require no soaking, so this salad is quick and easy to prepare. Serve as a side salad or add a cup of diced mozzarella and it makes a light main dish. Place lentils in a large saucepan. Cover with water to 2 inches above lentils; bring to a boil. Reduce heat and simmer 30 minutes or until tender. Drain well. Place lentils in a large bowl. Stir in onion and next 4 ingredients (through pepper). Add vinegar and oil; toss well. Serve at room temperature. Rinse the lentils and cook them for 30-45 minutes in 2 quarts of water with the onion and celery. Season with salt and pepper to taste. Remove the lentils with a slotted spoon and strain the broth, discarding the celery. Reserve the broth and onion separately. Slice the onion and sauté it with the oil and the garlic for 3 minutes; add the tomato sauce and cook 2 minutes more. Add the lentils, the spinach and the lentil broth. When the soup comes to a boil add the rice and cook, stirring occasionally, until it is done, about 15 minutes. Adjust seasoning. Wash lentils well by soaking them briefly in water and changing the water at least once. Put them in a 2-1/2-quart saucepan, add cold water to cover and bring to a boil. Lower heat to simmer and cook until not quite done, about 30-40 minutes. Meanwhile, pierce the sausages in several places and then put them in a small saucepan. Add the chicken broth and place over medium heat. Bring to a gentle boil and simmer for about 40 minutes. From time to time, skim off and discard foam and fat that rise to the top. When sausages are done, remove the pot from the heat and let them sit in the broth while you finish the lentils. Warm the oil in a medium skillet and saute the onion, celery, carrot, garlic and sage in the olive oil over medium heat until the onion is translucent and the vegetables are done. Drain the sausages, saving their liquid. To the lentil pot, add the vegetables, season with salt and pepper and add the tomato paste. Mix gently using a wooden spoon. Add 3/4 cup of the broth in which you cooked the sausages. Taste and adjust the seasoning, if needed. 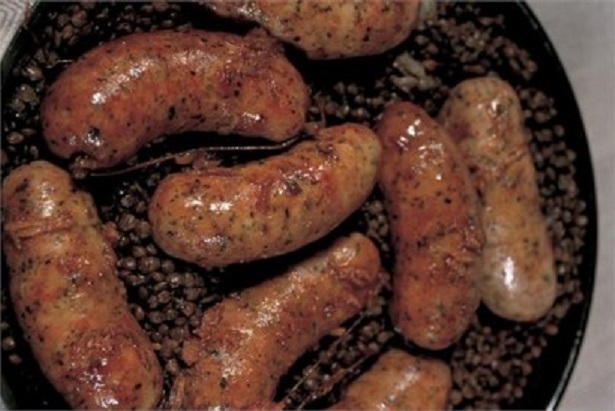 To serve, arrange the sausages on a platter next to the warm lentils. In a large pot over medium heat, warm the olive oil. Add the onion, carrot, celery and garlic and cook slowly until the vegetables soften and turn golden, about 20 minutes. Increase heat to medium-high and add the tomato paste. Cook until the mixture dries out a bit, about 3 minutes. Pour in the reserved juice from the tomatoes and cook, scraping the browned bits from the bottom of the pan, until the liquid has reduced by half, 1 to 2 minutes. Stir in the lentils, tomatoes, and 1 cup water. Bring to a boil, then reduce heat. Season with the oregano,crushed red pepper, salt and pepper and simmer until the lentils are tender, 30 minutes to 1 hour, depending on the lentils. (If the sauce begins to dry out, add additional water as needed.) Reduce heat to low and keep warm. Cook the pasta according to the package directions; drain. 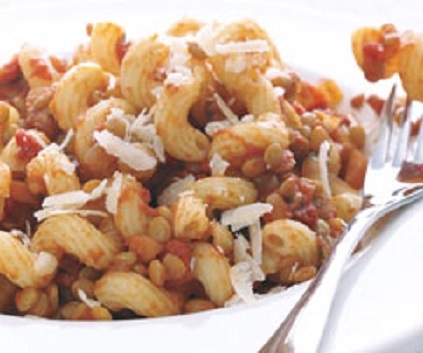 Serve with the lentil sauce, sprinkle with the pecorino and garnish with basil. Pour 3 pints (2 liters) water into a large saucepan, add the herbs, onion, carrot, celery and peppercorns and season with salt. Gradually bring to the boil, then lower the heat and simmer for 30 minutes. Add the fish bones and return to the heat, bring just to the boil; lower the heat and simmer for 20 minutes. Remove from the heat and let the fish bones cool in the stock for a stronger flavor. Strain the stock. Heat 1 tablespoon of the olive oil in a skillet and add 1 tablespoon each of the celery, carrot and onion and cook over a low heat, stirring occasionally, for 5 minutes. Stir in the lentils and cook for a few minutes more. Heat the remaining olive oil in a shallow saucepan and add the remaining celery, carrot and onion and cook over a low heat, stirring occasionally, for 5 minutes. Add the sea bass and the squid. Increase the heat to high and cook for 1 minute, then add the prawns, langoustines, clams and lentil mixture. Pour in the strained fish stock, tomatoes and season with salt and pepper. Cook until the fish is tender. Remove the pan from the heat and add the parsley and basil. Serve with a drizzle of olive oil. Heat a large deep skillet with a cover over medium heat until hot. Add the beef to the skillet and brown evenly. Season the beef with salt and pepper to taste. Add water, onion and bay leaves to the skillet; bring to a boil. Reduce heat; cover tightly and simmer 1-1/4 hours. Add lentils, carrots and Italian seasoning to the skillet; return to a boil. Continue simmering, covered, 30 to 45 minutes or until lentils and beef are fork-tender.